Recent storms significantly damaged island’s landing dock. CHANNEL ISLANDS NATIONAL PARK — Santa Barbara Island remains closed to the public due to a damaged landing dock. The public dock is the only access point to the island for boaters. High surf from a couple storms initially damaged the public dock and the access ladder in December 2016 and January. The recent storms Southern California experienced caused significant damage to the pier pilings and the dock building. Waves hit the dock building and damaged a portion of the building. The island is in need of temporary as well as long-term repairs. Even the trails were damaged from the recent storms. “We are going to have to do temporary repairs to the dock and the trails before we open it up to the public,” Channel Islands National Park Public Information Officer and Chief Interpreter Yvonne Menard stated. Before repairs can begin, a proposal with estimated costs needs to be completed. Funds will be required as well, according to Menard. Park staff was on the island when the damage occurred. Staff has to be transported to and from the island via helicopter. Capt. Holly Scott, owner and publisher of Charlie’s Charts Cruising Guide, conducted a workshop about the Channel Islands at the Women’s Sailing Convention in Newport Beach Feb. 4. 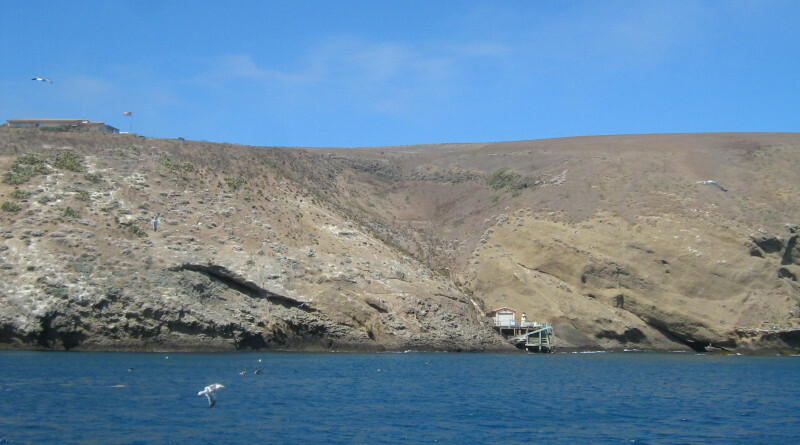 She pointed out there is only one cove to anchor at Santa Barbara Island and one public dock to access the island. Scott advised boaters arriving at Santa Barbara Island to have a dinghy big enough for the swells but light enough to be able to pull it up the ladder of the pier. Boaters who have tied their dinghy to the dock ended up stranded on the island when the dinghy gets punctured and deflates, Scott warned. Scott also informed the workshop attendees of the damaged landing dock and no access to Santa Barbara Island at this time. “The landing takes a lot of abuse from the swells,” Scott said in an email to The Log. Alternative methods to access the island for private boaters will be looked into, according to Menard. This didn’t happen recently – the island has been closed for over a year already! They need to figure out a safe way to access the island by dinghy, without a chance of damaging it.